If you’ve fought with questions like, “Will God love me if I keep sinning,” and “Does God’s grace mean I can continue to live in sin,” then Paul Ellis (Escape to Reality) has presented an excellent article titled “An Open Letter to Hot-Blooded Young Men” that’s right up your alley. By the way, you don’t really have to be a hot-blooded young man to find his words profitable. Take a look… here. This entry was posted in Reblog and tagged Christianity, Divine grace, grace, Paul Ellis, Religion and Spirituality. Bookmark the permalink. 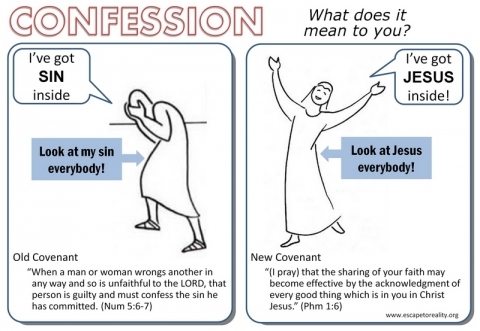 What does confession mean to me? It means my sin is obnoxious and deserving of the severest penalty. It means that by His grace and mercy, my sin is forgiven and totally forgotten, because the penalty was paid by Jesus. Since Jesus has no sin, when someone has Jesus living withing them by the power of the Holy Spirit, that person no longer arbors “sin”.